Consumers say they’re happy with service at restaurant chains, but that doesn’t mean they’ll come back. 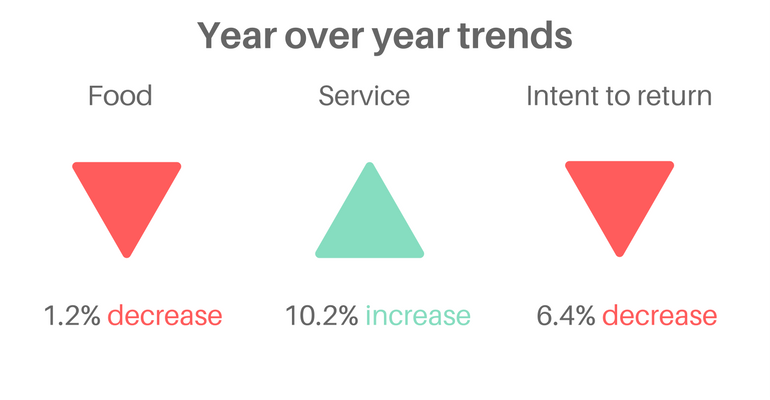 Restaurant service scores rose 10.2 percent in April, according to a new Restaurant Guest Satisfaction Snapshot by White Box Social Intelligence, from the Dallas-based data company TDn2K. But when asked whether they intended to return, consumers were far less generous. Intent to return scores fell 6.4 percent in April, compared with the previous year. Customer satisfaction with food fell 1.2 percent in April, according to White Box Social Intelligence, but food numbers had actually risen all year before that, according to Victor Fernandez, executive director of insights and knowledge for TDn2K. The decline in food satisfaction could be an anomaly, he said. The results suggest that on some level, restaurants are failing to build brand loyalty with consumers. Consumer surveys on future plans can be tricky, as there is frequently a difference between what a consumer plans to do and what he or she actually does. But the results come at a time when the restaurant industry is struggling to generate consistent sales and traffic. Same-store traffic dropped 3.6 percent in the first four months of the year, according to Black Box Intelligence, which is also part of TDn2K. And there is some correlation between intent to return scores and sales at specific restaurant chains, giving hope to brands like Qdoba Mexican Eats, which was among the top-performing chains based on customers’ intent to return. Consumers have far more dining choices than ever, and they are reluctant to definitively state that they will return to a concept, even when they get good service. Indeed, one of the best-performing companies, both in terms of service and intent to return, wasn’t a restaurant chain, but the convenience-store chain Wawa, which has been making big moves with its food offerings in recent years. Consumers were happier with Wawa’s service than with any other restaurant chain listed. 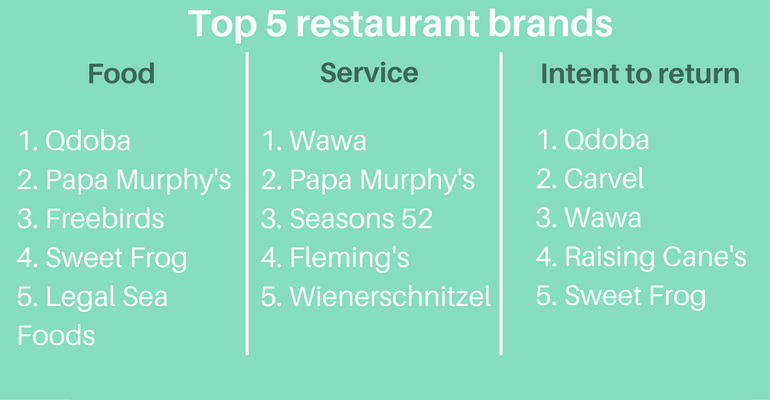 Fernandez also noted that the survey’s best-performing chains varied widely, from c-store chain Wawa to upscale-casual concepts such as Seasons 52 and Fleming’s Prime Steakhouse. “Consumers have an expectation, and they calibrate that expectation,” Fernandez said. The Guest Satisfaction Snapshot is the first such survey from White Box Social Intelligence, which has been gathering the data since 2013.